It! 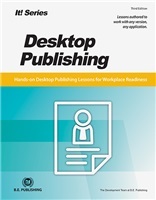 Series, 3E: Desktop Publishing available in eBook format only. It! Series, 3E: Desktop Publishing will show students how to apply their desktop publishing skills in their own lives. 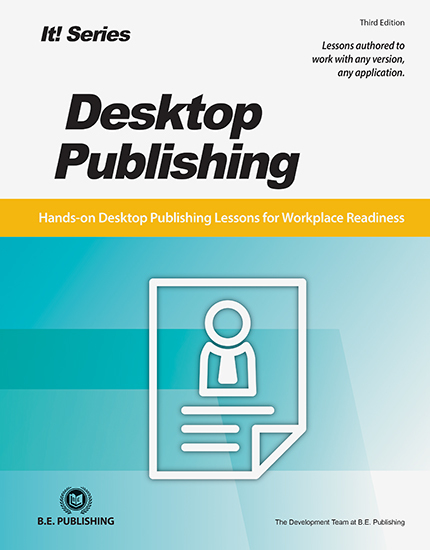 Across 25 all-new lessons, students will explore the power of desktop publishing as they develop professional documents like informational brochures and order forms, and encounter relevant topics like effective design technique and personal branding. From publication basics to creating promotional materials, It! Series, 3E: Desktop Publishing is the ideal program for any computer applications course. The Online Instructor Resources for the It! Series, 3E: Desktop Publishing include Lesson Answer Keys, Grading Rubrics, and Review Worksheets and Assessments. Review Worksheets and Assessments assess students' knowledge and ask them to demonstrate their desktop publishing skills. The Review Worksheet measures students' knowledge of desktop publishing from Part 1. Question types include true/false and short answer. Assessments measure students' ability to demonstrate the desktop publishing skills in each Part.